Twenty-four years, nine months and ten days. This is how much it took me to find out that beets can be roasted and are better than boiled ones. Much better. Growing up, when my mother and I would go to the downtown market “looking for our lunch”, as she always says, we knew that buying beets meant one thing and one thing only: boiled beets salad with cumin. It is the only beet recipe I have in my recipe notebook. The only way I ate beets for the last twenty-four years, nine months and ten days. The only way I thought beets could be eaten. Needless to say how confused and lost I felt when hearing about this cooking method on the radio. This was a lot worse than the day I discovered that the tooth fairy was in fact my parents sneaking into our bedroom, and hiding our teeth in my father’s diplomatic pouch- my sister and brothers didn’t want to believe me when I told them the truth and decided not to talk to me for two whole days. I couldn’t wait to buy some beets last week and do the unthinkable: revisit my mother beets salad. The traditional way, or at least the way my mother would serve it, was to boil beets for nearly an hour, peel them, and serve them with ground cumin, parsley, sometimes boiled eggs, and an orange vinaigrette. My version is a little bit similar in the basis, as I love the combination of beets, cumin and orange, but so much better than the original in taste. Sorry Maman! Roasting the beets really brings out their natural sweetness, preserve their vitamins and gives a meaty, caramelized texture to the beets- compared to watery boiled beets. Cumin seeds are roasted along with the beets to allow their smokiness to penetrate the flesh deeply, while the orange and honey vinaigrette freshens up the whole dish and sort of highlights each ingredient. It is really an explosion of smokiness, sweetness and warmth in one salad. It became our favorite root vegetable salad and the only way we will be eating beet salad from now on and for the second time in two weeks. Preheat the oven to 400F. Line a large sheet pan with foil. Put the beets, shallots, and cumin seeds in the middle of the foil. Season the mixture lightly with salt and pepper and drizzle with some olive oil. Toss to coat. Fold the sheet of foil over the vegetables as you would fold a letter, and bake until fork tender, about 45 minutes. Meanwhile, whisk the honey with the Meyer lemon juice, half the chopped parsley, salt, pepper and the orange zest. Add the olive oil while whisking until the vinaigrette comes together but is still a little light. Toss the hot roasted beets with the vinaigrette. Sprinkle the toasted silvered almonds on top, the remaining parsley, and a little bit of orange zest. Serve warm. You can scatter some goat cheese too. It’s lovely with beets. Préchauffer le four a 200C. Garnir une grande tôle de papier aluminium que vous laisser un peu déborder des bords. Mettre au milieu du papier les betteraves, les échalotes et les graines de cumin. Assaisonner de sel, poiver et huile d’olive pour bien couvrir les legumes. Mélanger pour bien répartir l’assaisonnement et faites cuire jusqu’à ce que les betteraves soient bien tendres, environ 45 minutes. Entre temps, préparer votre vinaigrette. Battre à l’aide d’un fouet le jus de citron, le miel, la moitié de persil, sel, poivre et zeste d’orange. Verser dessus l’huile d’olive en filet. Mélanger les betteraves encore chaudes a la vinaigrette. Décorer d’amandes effilées, le reste de persil et un peu de zeste d’orange. Servir tiède. Vous pouvez aussi disperser un peu de fromage de chèvre au dessus. C’est superbement bon avec les betteraves. I am glad that you have finally discovered roasted beets. I think that the flavour is more intense this way. I also like steamed beets too. Roasted beets are really wonderful, in a whole different league from the Harvard beets I grew up with. I like mine on a bed of butter lettuce with some walnuts and goat cheese and a little dijon vinaigrette! Tonight for dinner I had a toasted baguette round with brie, smoked salmon, cucumber, dill and red onion. Great for after a workout. 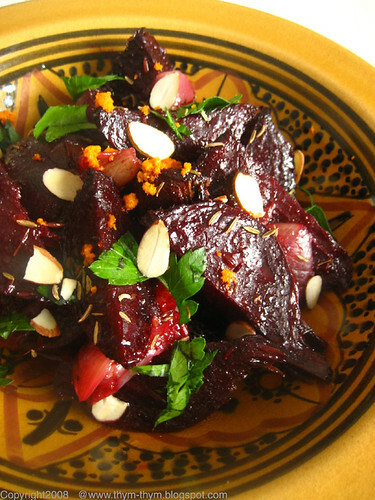 Roasting beets in orange juice and honey is my favorite way to serve them, either on their own or topping a salad. 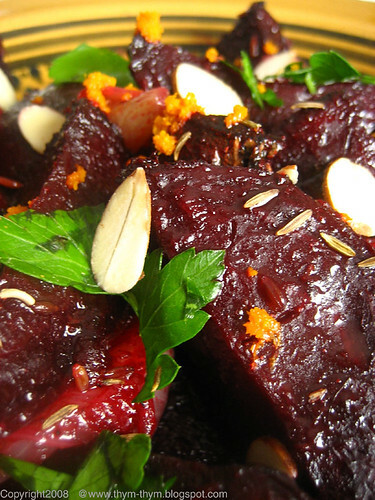 My husband is a beet fanatic -- and I think they're pretty darned delicious, too. Well, I'm glad you've come over to the other side! Roasted beets cannot be beat! Sorry, I couldn't resist. I've always roasted them without any spices but now I will have to try this. How nice that you were able to use the meyer lemon in this dish. And the almonds are a lovely touch. And yes, fromage au chevre would be wonderful! Beets are a favorite of mine. The cumin seeds are a wonderful touch I would never have thought of. Beautiful salad! Roasted or pickled are the only ways I can eat this veg! Such a beautiful colour but so horribly sweet. Love the sound of the dressing too. I've never tasted other betts than boiled onse, and It's absolutely not my cup of tea. It's hard to find raw beets here, and i'd really like to taste some. - Hi Nora! I am glad I did too! This give me millions of ideas on how I can use beets in the futur. I won't consider them as "salad" vegetables anymore. - Hi Deborah, mmmmnnn! Your salad sounds so good and so delicate! You're right, goat cheese goes very well with beets. - Shayne, I had pickled beets a couple of weeks ago for the first time, and they are very addictive. Thank God I didn't know them when I was pregnant and craving pickles all the time ;) If all your workouts resulted in a brie and smoked salmon baguette, sign me up for next time! - Lydia, ohhh! Roasting them in orange and honey! Thanks for the tip! I read somewhere that you can even roast them with anise star. That's interesting! My husband became a beet fanatic too after I started roasting them. - Christine, That's a good one!Trop forte La Christine! Now that you will have lemons confits in a few weeks, you should add them to the vinaigrette as well! Yum! - Lisa, thank you very much! You should try adding cumin to your beets next time. It does make a big difference. Last summer I convinced my little cousins that beets weren't evil by getting them to try a roasted beet salad and explaining that sugar was made from beets so they couldn't possibly be bad! I love beets. I just discovered that I can bake them after reading Bouchon. So I'll have to try it when we have good beets in the summer. I have never liked beets, but it has been forever since I've tried one. You've inspired me to give them a try again! - Helene, I can't wait for summer either. I'm thinking I should pickle some beets. - Kristen, glad I did. They are really not that bad. Trust me. You are a baby beet discoverer compared to some of us who were, um, well into our fifth decade before seeing the light. Feta and mint are also very nice companions for beets. thanks for this! i have a lovely bunch of golden beets sitting in the crisper, and i've been putting off doing something with them because i haven't been convinced that there's a way to make them truly tasty (other than shaved raw over a salad, which is also really good). pickling doesn't do it for me. roasted beets a l'orange will be making an appearance alongside some pork tenderloin on friday's night dinner plate! hi Warda ! J'ai trouvé le temps long...Et sur quoi je tombe des que j'ouvre ton blog ...une falsification de MA RECETTE de salade de betteraves !! Pirate !! sorry,sorry,si je veux..
Warda, that salad looks absolutely mouthwatering! Roasting beets definately brings out the best in them. I like mine with some garlic spiked yogurt and turkish chili flakes. I look forward with hope, to seeing some random facts about you soon. - Maria, in a way, that's comforting!I thought I was th only one. I've tried feta before and love it, but never mint. Sounds reffreshing! Thanks. - Us V. Food,Oh how I love golden beets. I am glad this recipe inspired you to rescue them from the fridge. Happy cooking, and please, let me know how it goes if you try it. Sounds like a great recipe. J'aime bien les betteraves bouillies en vinaigrette mais je parie que les tiennes seront bien meilleures car elles n'auront pas perdu de leur jus. Meyer Citron, is this some kind of juice in a bottle? J'espere avoir repondu a ta question. We made these last night, thanks much for the recipe! 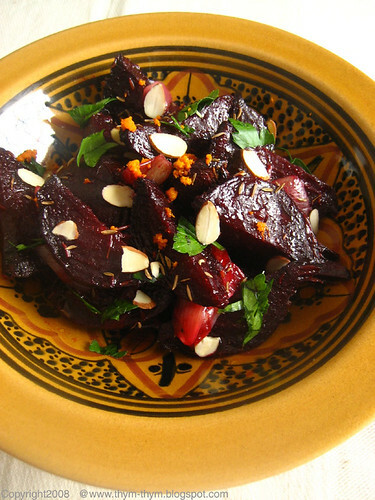 Warda, I came across your blog while searching for a beet salad recipe. This looks absolutely perfect for dinner tonight. Thanks for sharing the recipe! - Kasey, I hope you'll enjoy it! Have a wonderful dinner! Thank you so much !!!!!!!!!! Hello Warda! I found your blog via Pinterest and am in LOVE with your recipes as well as your perspective as shown through photos and your lovely writing. I tried pinning them and found you've blocked that. Do you have a Pinterest account I can follow? Thanks so much! Summer, Thank you for the kind words. I have to admit I have no clue how Pinterest works. I know what it is but have no idea why it says that I blocked it. Will try to figure thus out. Thank you for following.